my border is Bert. His story: too smart, wish he helped the kids with their homework!!!. Knows every toy by name, will get the one i ask for on the first command,... (more) don h.
The Border Collie is an active, intelligent, dog that is a great family companion. It is known for its exceptional ability to herd sheep with its eyes, and is also a great dog for sporting events. This is a high-energy breed with an extremely active mind to match its agile movements. It is quite intelligent, which suits it well for agility and herding trials, or cause it to resort to mischief if not given appropriate activities in which to exercise its mind. It is very alert and trainable. This breed is amiable toward friends and family, though wary of strangers. Breed Type This breed is a member of the herding dogs. These dogs were bred for herding cattle or sheep, which explains many of their characteristics. They are extremely active, intelligent, and driven to work. If not provided with an organized activity, such as herding trials or Flyball, these dogs are likely to find something less desirable to do, such as digging up gardens or chewing on shoes. Herding dogs are still currently used to herd livestock, but they can also be great pets for active owners with the time and energy to meet their needs. Background The Border Collie originated from the British Isles, and spent much of its developing history in the border country of Britain and Scotland, hence the first part of its official name. The second part, "Collie" has less certain origins. It may come from the word "coalie", meaning black, a Gaelic work meaning "useful", or from the name of a particular Scottish sheep breed. No matter the specific origins of its name, all these terms represent important aspects of this breed. The Border Collie was selectively bred for its skill in herding sheep, which includes its ability to use its eye to intimidate sheep. The Border Collie is still used for herding sheep in Britain and the U.S. It is also known for its high performance in agility trials. Description The Border Collie is a small to medium-sized dog, weighing 30 to 50 pounds and a height of 18 to 22 inches, with females being slightly smaller than males. It has a lithe, muscular body and is longer than it is tall. The head is broad with a tapering muzzle. The ears are either erect or semi-erect, and the eyes are brown, blue, or semi-blue. They are known for their alert, mesmerizing eyes they use to stare down sheep in order to herd them. The forelegs are shorter than the hind legs and the tail is long. The coat can be rough or smooth and is most commonly black and white, but can be any color except all white. The average lifespan for this breed is 10-15 years. Care and Feeding This breed has no special dietary needs. It should simply be fed a well-balanced canine diet. Moderate grooming is required to prevent matting of its coat. Housing Your Dog Border Collies are active dogs that need a rural or suburban home with a large yard. Social Behaviors The Border Collie is friendly with people it knows and reserved around strangers. It is also friendly with children and other dogs, though it may attempt to herd them. Not surprising, it will chase livestock, cats, and other fast-moving animals. Handling and Training This breed benefits from training and socialization. Activities This breed needs a structured activity to keep its mind and body stimulated. It was specifically bred for herding sheep, so herding or participating in herding trials are natural choices for activities, but agility trials, Frisbee, jogging, and swimming are suitable as well. Breeding/Reproduction Average litter size is 4-8 puppies. Common Health Problems Border Collies are susceptible to osteochondritis dessecans (OCD) and progressive retinal atrophy. OCD is the result of damaged or abnormal cartilage growth. This disease causes discomfort in the affected limb, and can eventually cause lameness. OCD can be diagnosed by a veterinarian and treated with a combination of rest, anti-inflammatories, and painkillers or surgery. Preventative efforts consist of selective breeding, limiting strenuous activity, such as jumping, in young dogs, and providing a well-balanced diet. Progressive retinal atrophy causes night blindness first, and then day blindness. There is no treatment for this disease, but many dogs adapt well to blindness, with few signs of the ailment, as long as they are in a familiar setting. 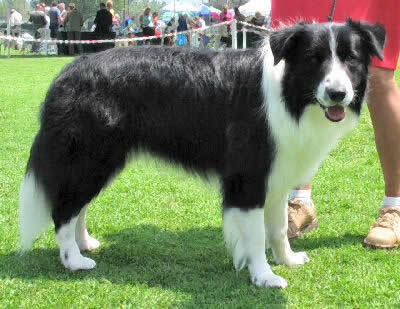 Availability Border Collie breeders can be found on the internet or locally. Prices range from $100 for an adult, $300-$800 for pet quality puppies, and $1000-1500 for a show or breeding quality puppy. References Fletcher, W. R. (1977). Dogs of the World. Toronto: Ridge Press. Larkin, P. (2002). The Ultimate Encyclopedia of Dogs: Dog Breeds & Dog Care. London: Hermes House. Pet Education, www.peteducation.com (2007). Foster & Smith Inc.
my border is Bert. His story: too smart, wish he helped the kids with their homework!!!. Knows every toy by name, will get the one i ask for on the first command, and usually takes only 3 times for him to know the name of a new toy. He has close to 30 toys. Never yard trained, he just seemed to pick up on the boundary. We live in the city with a small yard. We run / walk a lot. We use plain terms and commands ie; when on a walk he leads the way. I can tell him which direction to go by just saying turn right, left, go straight. He knows his right from left including which paw to give which comes in handy when cleaning. This is a small sample. He constantly is learning and always seems to want to learn. I can't see ever getting a different breed. My dog's was Dora the explorer and she lived up to that name but she never strayed very far, came when called and she was my first dog and I loved her to bits. You'll always be in my heart dora my baby girl I love you. I love these dogs. I have 1 that is really active. He can jump about 4 foot high. His name is charlie. A neighbour of mine had a collie also and she used to love to play fetch with sticks. You just had to pick up a stick for her to get ready to aim! She was a real peoples dog and never bothered with other dogs. She had blue eyes.